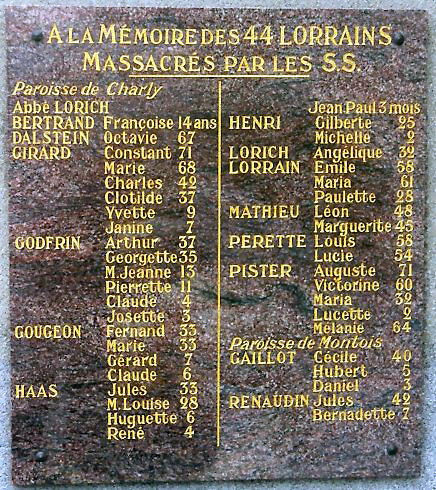 This is the separate memorial to the 44 victims from Charly (mounted to the right of the full list of 642 names) in the cemetery at Oradour-sur-Glane. After the war, Charly (3 miles east of Metz) was renamed, Charly-Oradour in their memory. If you compare this memorial with the ones at Charly-Oradour itself, there are some minor differences, such as the age of Melanie Pister which is given here as 64 and at Charly-Oradour she becomes Vivienne-Jules and is 65. Also the parishes here are quoted as being Charly and Montois, instead of Montoy-Flanville, 8km to the south-west (there is a parish of Montois la Montagne 16km to the west of Charly, which is where I think the confusion originated). These discrepancies should not be allowed to form the basis of any 'revisionist' claims. That they should not occur is quite true, but in the real world, people, (in this case Stonemasons) do make mistakes, but this does not mean that they are liars. See also the separate list for the victims from Alsace and for those of the Jewish faith.